The Sigma Touch is at the cutting edge of coffee vending technology. 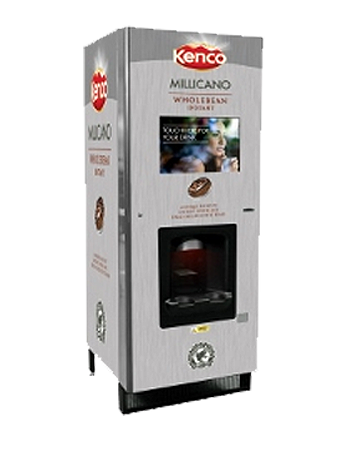 At it’s heart is a floor standing coffee machine that is available with coffee either made from whole beans or from coffee granules as well as leaf tea, hot chocolate and soup. In addition there is the option to have flavoured syrups (such as hazelnut or vanilla) in your coffee. A full range of payment systems are compatible with this machine including change giving coin mechanisms, card units and even software to allow customers to pay via Paypal. 7, 9 and 12oz cups are all compatible with the Sigma or you can use your own mug by simply placing it in the drink delivery station where the machine will sense its presence and dispense the drink into it rather than a paper cup. As with all coffee machines that are plumbed into the mains water supply in London and the South East of England we would recommend that a good quality water filter is fitted to reduce problems caused by hard water (such as limescale build up). There is a flush facility on the Sigma which helps to reduce the amount of regular cleaning required (although it must be stressed that it will still need cleaning at least once a week). The Sigma Touch is ideal in public sites such as universities, petrol stations and civic offices although it will work just as well if positioned as an office coffee machine. We can supply the Sigma Touch across London and the surrounding areas and can provide a full technical back up as well as all of the products that you will require for use in the machine. If you don’t want to fill and clean the Sigma yourself our fully trained operators can visit your site in order to keep the machine filled and cleaned on your behalf, allowing you to offer a first class coffee machine without any of the hassle.